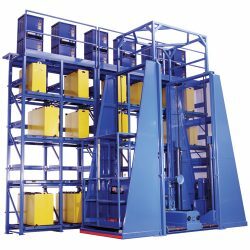 BHS Quad Stack System Stands (BS-QS) provide the ideal location to charge, store, and exchange lift truck batteries with convenience and ease. These heavy-duty, steel-constructed stands complement a Quad Stack Operator Aboard Battery Extractor to create an ideal battery-charging process. Rearward-pitched battery slots assist in battery retention and welded system feet provide stability. Charger-cable mounting holes, charger anchoring slots, and auxiliary backstops protect valuable equipment and keep system stand impeccably organized. The BS-QS features spark-proof, poly-sleeved rollers that extend product life and reduce corrosive buildup. Available models offer compartment widths from 15 inches to 48 inches making them compatible with almost any lift truck fleet. Over a dozen compartment configurations, safety features, and other options are available to provide custom solutions for your operation. Optimize your battery room with a Quad Stack System Stand from BHS. Contact our sales team at +1 314 423 2075 to learn more about BHS System Stands or to locate a dealer.